Hussein is Muslim. He loves the Ramadan holiday and eating with his family. Circumstances require Hussein to take on a new name and identity. Hussein is renamed Harry but he holds onto his real name and faith traditions. 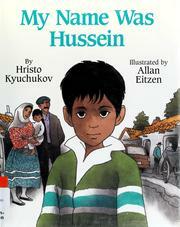 Kyuchukov, Hristo, “My name was Hussein,” Children's Picture Book Database at Miami University, accessed April 24, 2019, https://dlp.lib.miamioh.edu/picturebook/items/show/14042.